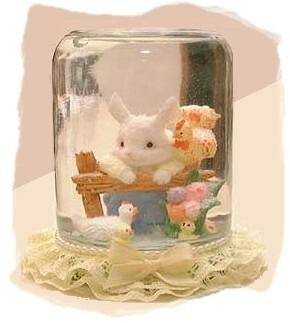 Recycle a small glass jar to make this lovely bunny water globe. It is quite easy and inexpensive to make and will look charming for Easter decorating.
. Any residue will eventually dissolve and ruin your snow globe over time. Glue your ornament to the centre of the inside of your lid. Allow this to dry at least 24 hours [72 hours is suggested]. Place glitter in a little distilled water (cooled boiled water is fine) and allow the glitter to soak for at least one hour. This helps to eliminate any clumps of glitter that may form. If any clumps do form, break them apart before adding to your globe. Fill your jar to the very top with distilled water (the overspill will help to stop any giant air bubbles in your globe), add your glitter, removing any clumps that may have formed and add a few drops of glycerin for every two cups of water. Do not add too much glycerin or your glitter will not fall properly. Glycerin helps the glitter to fall a little slower, but adding too much will not work well. So just a drop! Gently place your lid on the bottle, go slowly as not to disturb the water too much and seal tightly. There will be overspill so do this in a sink. You do not need to dress up the bottom of the globe, but you can. Using hot glue, glue a strip of lace around the lid rim and then glue another strip of lace around the bottle (between the lid rim and the jar). To finish, glue a strand of pearls to the top of the second lace strip and glue a small bow to the front centre of your globe.